I’ve heard that you shouldn’t sleep with dentures in your mouth at night, but what really is the harm? This is a very common question. Dentures (removable false teeth) offer a number of benefits to people who have lost their natural teeth: They can help them regain the ability to eat a greater variety of foods, speak more clearly, and smile with confidence. However, it’s important to recognize that there are also some downsides to wearing dentures. For one thing, they put pressure on the gums and consequently the bony ridges beneath them. This causes resorption, a process that results in a gradual decrease in bone volume and density. Resorption and bone loss are accelerated if dentures are worn 24 hours per day. With the loss of bone comes inadequate support for the dentures, causing them to become loose and fall out more easily. This also results in less support for the cheeks and lips, which can cause very dramatic changes in facial appearance. In addition, if they are not properly cared for, the under surfaces of dentures in particular can become breeding grounds for oral bacteria and fungi, which can cause odors, irritation and disease. Resorption and bone loss are accelerated if dentures are worn 24 hours per day. It has been found that those wearing dentures during the night while sleeping are more likely to have tongue and denture plaque, gum inflammation, positive cultures for Candida albicans (thrush, an oral yeast infection) and higher blood levels of interleukin-6 — a protein made by white blood cells that signifies the body is fighting an infection. Good oral hygiene among denture-wearers is very important and reduces the risk of serious illness. 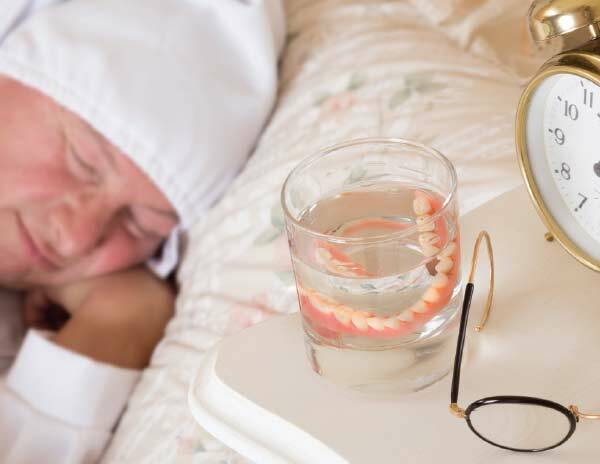 For example, a recent study involving 542 randomly selected elderly nursing home residents found that the seniors who wore their dentures to sleep were 2.3 times more likely to die or be hospitalized from pneumonia as those who took their dentures out. The study noted that aspiration (breathing) is a significant means of moving pneumonia-causing bacteria from the mouth into the lungs in elderly people. Whether you wear full or partial dentures, taking them out is important to give the gums and other denture-bearing tissues a chance to rest, recover and receive beneficial exposure to the antibacterial agents naturally present in saliva. There are other concerns. Wearing dentures continually, and especially at night when salivary flow naturally diminishes, often results in a condition called denture stomatitis (“stoma” – mouth; “itis” – inflammation). This affects tissues under dentures. Typically it occurs under upper full dentures that cover the palate, which becomes reddened, inflamed and infected with yeast. This is often accompanied by a disease called angular cheilitis, a cracking at the corners of the mouth and subsequent infection by the same yeast. Denture stomatitis is treated by leaving the dentures out at night, and cleaning them meticulously. Yeast infection is treated by anti-yeast or anti-fungal medication and/or chlorhexidine prescription rinses that can be prescribed by your dentist. Whether you wear full or partial dentures, taking them out is important to give the gums and other denture-bearing tissues a chance to rest, recover and receive beneficial exposure to the antibacterial agents naturally present in saliva. In short, removing your dentures for at least five to six hours per day is the healthiest thing to do. When is the best time to do that? It used to be recommended that dentures should always be removed at night. However, a recent concern is the issue of Obstructive Sleep Apnea (OSA). For some people, wearing dentures at night actually may help prevent OSA — a dangerous sleep-related breathing disorder. If you are at risk for OSA, it may be best for you to remove your dentures only during waking hours to give your supporting tissues a rest each day. Remove and rinse your dentures after eating. Brush your dentures at least once a day with a soft toothbrush, nailbrush or denture brush and dish soap, liquid antibacterial soap, or denture cleanser. (Don’t use toothpaste: it is too abrasive.) Using an effervescent (fizzing) tablet can’t substitute for this type of manual cleaning, and it might take some effort to remove the plaque or film that develops on the dentures. Store your dentures in water or, better yet, an alkaline peroxide-based solution made for this purpose. Brush your gums and tongue every day with an extra-soft toothbrush (not the one you use for cleaning your dentures) or clean them with a damp washcloth. Rinse your dentures before putting them back in your mouth. Even though you no longer have natural teeth, you still need to pay attention to your oral hygiene. Wearing your dentures 24/7 will prevent you from maintaining good oral hygiene, unnecessarily putting your health at risk.